Bruce Hornsby's latest album Absolute Zero is out now. In 1986, Bruce Hornsby became famous for his single "The Way It Is." But since then, he has embraced the constant evolution of his musical style throughout his career, experimenting with jazz, classical and even country. Never the same kind of musician, Hornsby has jammed on the accordion with the Grateful Dead and composed movie soundtracks for Spike Lee. His latest album, Absolute Zero, out now, is an embodiment of this constant motion, spiraling into whatever creative vision Hornsby has next. Throughout his ambitious exploration of genre and sound, Hornsby says he always follows his own instinct. "I'm just interested in my older age and trying to make a sound that I haven't quite heard before," Hornsby says. "This record shows different ways that I'm trying to do that." The album features skitter-y piano, doleful strings, bubbling percussion, and inspiration drawn from other fields Hornsby admires like science and literature fiction. One track, "White Noise" is specifically based on his favorite work by David Foster Wallace, The Pale King. "It's kind of a book about boredom. It's a book about IRS regional examination centers and the workers there," Hornsby explains. "So this song is about tax return examiners and CPAs is as American heroes." Hornsby's latest exploration, Absolute Zero, is out now via Zappo Productions. Hornsby joined NPR's Sacha Pfeiffer to talk about searching for inspiration in unlikely places and how Absolute Zero came together. Hear their conversation in the audio link. In 1986, Bruce Hornsby got famous in the pop music world thanks to this hit single, "The Way It Is." BRUCE HORNSBY AND THE RANGE: (Singing) That's just the way it is. Some things will never change. PFEIFFER: But change, it turns out, is something Hornsby has embraced over his long career. He's no longer the same musician he was in 1986. He's jammed on accordion with the Grateful Dead. He's composed movie soundtracks for Spike Lee. He's experimented with jazz and classical and country. And his new album is an embodiment of all that variety. It's called "Absolute Zero." And here's one track from it that one of my colleagues said could be something from a futuristic universe where Steve Reich and Philip Glass meet up at a hip-hop club. BRUCE HORNSBY: (Singing) There's magic in our present tense - not coincidence, but fate. Stopping by woods to make new friends and buy some lemonade. 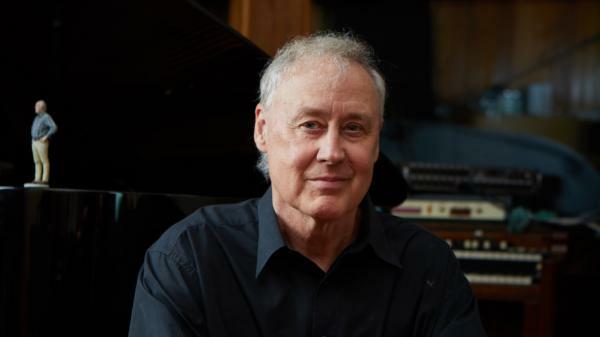 PFEIFFER: Bruce Hornsby joins us from our New York bureau. Bruce, welcome to the show. HORNSBY: Nice to be here. I really love the sound of that one more than the former one you played. PFEIFFER: When I began preparing for this interview, I realized you have a gigantic body of work over the past three decades that is nothing like what you did in the 1980s. But I gather you have to deal with that a lot from people who think you are just the Bruce Hornsby of the 1980s. HORNSBY: Well, I've been getting nasty letters from fans since my second record - oh, how dare you change? And I thought - well, OK, if this is going to happen - and it has continued to happen ever since - I'm not going to worry about this. I'm going to follow my own instinct artistically because it's a creative prison to feel like you have to placate that person who wants the same record year after year. HORNSBY: (Singing) Let's go sliding down the scale - way down, down beyond the veil. I'll be feeling fine at absolute zero. PFEIFFER: One advantage of having some celebrity is having access to other celebrities and you've been able to partner musically with people like Eric Clapton and Bonnie Raitt and Chaka Khan and Branford Marsalis. How do you decide which other musicians you want to team up with? HORNSBY: Well, you're assuming that I'm deciding. In most cases, it hasn't been that. It's been them calling me - getting a call out of the blue to play on a Bob Dylan record, say, or getting a call from Spike Lee to write an untitled song for his great 1995 movie "Cockers," for instance. But the genesis of this record in 6 out of 10 cases - it's six songs out of 10 - the origin were Spike Lee cues. And some of the cues have sounded like songs. PFEIFFER: By cue, you just mean a piece of music in a movie. HORNSBY: (Singing) Traveling to distant suns may be mankind's only hope. I'm just interested, in my older age, in trying to make a sound that I haven't quite heard before. And this record shows different ways that I'm trying to do that. "Blinding Light" is influenced by Elliott Carter, the great American composer who passed just a few years ago about one month shy of his 104th birthday - a model for us all - and the great Hungarian composer Ligeti. HORNSBY: (Singing) The secret nightmares of our - of our town. PFEIFFER: ...Which starts with an interesting staccato. HORNSBY: (Singing) Pour you and me onto paper. Fold us together, and press tight. I call it Bill Evans meets the hymn book. And so you're hearing a little Bill Evans on "Fractals." But it's mostly - that very jagged, skittery piano that you're hearing is mostly coming from the minimalist world to me - of John Adams and Philip Glass. HORNSBY: (Singing) You are often a beautiful snowflake. I can be an ice crystal. PFEIFFER: ...And David Foster Wallace. PFEIFFER: And some of the lyrics, to me, almost sound more like spoken word poetry than what we might think of as traditional lyrics. How does literary fiction inspire you to write lyrics? HORNSBY: Sometimes I'm really directly inspired - for instance, these two guys on this record. David Foster Wallace, my favorite novel of his is his unfinished novel "The Pale King." It's kind of a book about boredom. It's a book about IRS regional examination centers and the workers there. HORNSBY: (Singing) Tedium here, in this cubicle, he's doing his work. So this song is about tax return examiners and CPAs as American heroes. That also comes from a Spike Lee cue that was never used. Look. I'm really interested in finding new areas to write about, and the page is pretty filled in after 33 years of doing this. So I have to look a little farther afield to find something that I haven't done. I don't like to repeat myself, so it takes me to some areas that I love, science and modern literary fiction. What could be better? HORNSBY: (Singing) I'm sitting here on the phone, just listening to the dial tone. PFEIFFER: There are some heavy lyrics on "Absolute Zero," ones that sound a bit fatalistic, a little depressing. I'm thinking about the song "Meds." There's a line that says I've been in pain and I can't take the murk. PFEIFFER: And of course, I think listeners have to wonder how personal you're being there. So what's the story behind that song? HORNSBY: Well, it's personal to me because I've grown up in a family where different members have suffered greatly from depression. And my immediate family, we have that as well. It's just basically a tribute to depressed family members that I feel so close to and so in love with. HORNSBY: (Singing) I've been loving - been loving you with a little help from the meds, with a little from some sympathetic souls, embraced in a tender loving hold. HORNSBY: ...To try to be fully engaged in the now, and so I am. And - but yeah. But yeah. Go ahead. PFEIFFER: But I've read that you really didn't like that period of sudden fame. And in fact, you later left Los Angeles and moved back to your hometown of Williamsburg, Va. It made me wonder how much that was a deliberate renunciation of your pop music fame. HORNSBY: Yeah - no, no. I think it's not quite accurate to say I didn't like the fame. I just wasn't very good at it, to be honest with you. I mean, I was a pretty bad sort of, you know, "star," quote, unquote. I would find myself at some Top 40 star party in Cleveland and signing autographs for fans. And next to me would be New Kids on the Block, and next to me would be Tiffany. And there I am. And I'm looking around. I'm going, what's wrong with this picture? Oh, I get it. It's me. Look. I wasn't a good fit. All of that was not why I got into music. But the musical aspect of what I've done is exactly why I got into music because I've been able to stay creative. And our live concerts, for instance, are very spontaneous and very improvisatory. And so I really have been able to have my cake and eat it, too, as the cliche goes because I just let it fly musically. And on this record - this is a fairly spontaneous creation, didn't overwork things - just did them a few - a couple of times and went with it. And that's the way I like to work. PFEIFFER: That's Bruce Hornsby. His new album is called "Absolute Zero." Bruce, thanks for talking with us about your music. HORNSBY: Thanks for being informed, Sacha. Appreciate it. (SOUNDBITE OF BRUCE HORNSBY SONG, "MEDS") Transcript provided by NPR, Copyright NPR.